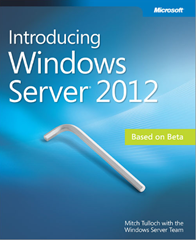 Brandon George posted a great article about a free e-book introducing Windows Server 2012. He explains the business needs for Windows Server 2012 and its relationships with the Hybrid Cloud. "This is a very important topic to understand, for a lot of different reason's that are highlighted in the above chapter notes. Windows Server 2012 will be a foundation piece or layer, that true Hybrid Clouds will be enabled via." I personally thanks Brandon for promoting these technologies that will help us stay ahead in our careers. Please go to his blog here to download this great material.